Ross Townsend. a second year at UC Davis. A slammin' dude bro. totally gnar gnar. As told by Devin R. Croda. " " FUN FACTS: Ross Townsend has never set foot inside of an IKEA. nay a 50 cent hotdog graced his lips, never a gaze upon that which he cannot afford. keeping it real. Ross Townsend is a new fan of the MTV reality series MAUI FEVER. Ross Townsend walks in a very original manner, as if he was once a victim of a crippling spinal injury, which he was later able to inspirationally overcome, though it left him scarred. he carries himself on his toes and bounces across the floor. there is also a slight bend in the back which accents his asset. ;) this is very similar to the infamous ross dance, which is an exaggerated ross walk with the inclusion of a care-free, running style hand gesture. Ross Townsend is an advocator of Apple computers, but broke his hard drive one day (at least in theory) by leaning on one corner of his laptop, thus resulting in a sad day for Ross, but hilarity for Devin. Ross Townsend dislikes jim boys tacos, and thinks it is a sleazebucket of an establishment. Ross Townsend currently lives in the Adobe Apartments, but is hoping to move next year, due to the other residents and poor bus service. this poor bus service will be less poor, once it is rich with the flavor of DTtownsend when he becomes a part of the Unitrans malitia. Ross Townsend is an aspiring tour guide for the UC Davis campus. Ross Townsend favors Tecate over PBR. Ross Townsend's favorite bands (past and present) include: Built to Spill, Slow Gherkin, hellogoodbye, muse, and killing the dream. Ross Townsend once played bass for the band Can't Stop Lamar, a high school, Danville based ska-punk sensation. he is now currently developing his new group, $Lousianna Hotgirlz$, despite controversy over the band name by former Can't Stop Lamar guitarist and close friend, Mike Lane. Ross Townsend has been known to call himself "DownTown" Ross Townsend, or just Downtown for short, a name given to him by Mike Lane. this name has sparked a desire in Ross to open his own Business under the name, which will be a safe haven for all under the tag line "downtown's - the most girls, the most drugs, the most music, the most pancakes!" Ross Townsend recent purchased an Alesis Micron from guitar center, after contemplating other models such as the Korg Microsynth. he has started taking piano lessons, but has soon realized he just wants to rock n roll, and not have to deal with piano standards. this is due to a rise in his college fund, which has given liberation to downtown's moneybooks. ladies! Ross Townsend has one older brother, who now resides in Iowa. Ross Townsend has 2 cats back in Danville, one short haired and one long haired. the long haired cat is named Midnight because of her black color. she is friendly and can be picked up if you are careful not to scare her. Ross Townsend withholds the power to don a Beanie cap and not be an ultimate douchebag. 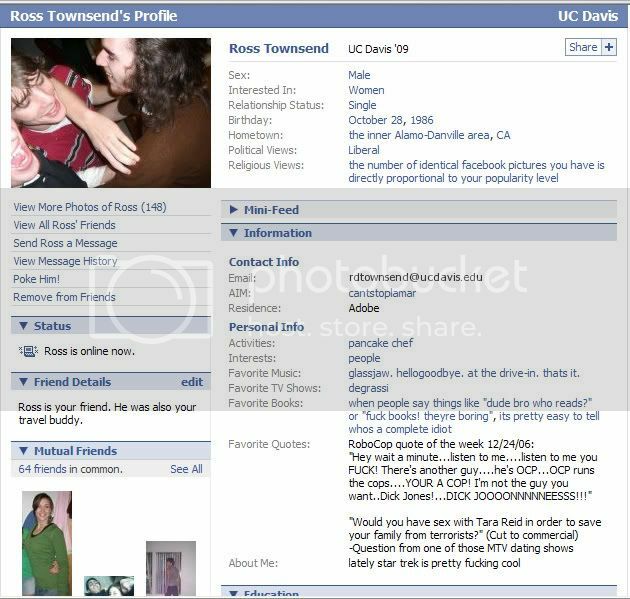 This is Ross's facebook page: " "
Ross Townsend lived in Segundo North his freshman year, but decided to move to Tercero South, to hang loose with the Kings of the other side of the tracks. He moved to building 1, floor 4. 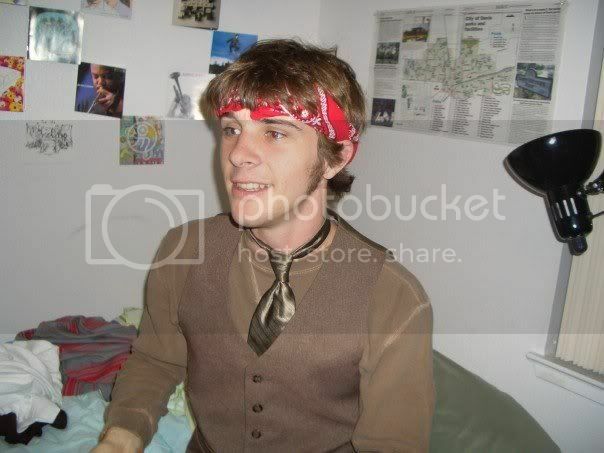 Ross Townsend once locked himself out of that room because he was chasing paul, leaving him stranded outside with his moderately clothed self and a bar of soap. Ross Townsend owns a Robocop poster, of which he is a huge fan, and a pre-dirty era christina agulera poster, which hangs in his room, and is the first thing he lays his eyes upon every morning. its been a while since this page has been touched in violating ways, so i plan to soon nurse it back to health. Ross Townsend has now in fact actually been to an IKEA. his first trek was to the sacramento based IKEA, buying an inflatable hedgehog (mole?) but failed to effectively leave the building with all the necessary components to assemble the seat. Ross Townsend has recently added Cool Spot, his new home on acacia lane with roommates devincroda, scott ibaraki, and peter darling, but failed to add them to the residents list. maybe this says a little something about Ross Townsends character?